I have a TON of blue fabrics in my stash, but nothing "royal" or a really bright "primary blue." I have scores of aqua, teal, (some) navy, and sky blue - but nothing like this. I have checked out 3 stores in my area with no luck and now I am turning to my online swap group. But if you have any suggestions for a print that is like the above fabrics - please, please let me know. I only need about a 1/2 yard. It has also come time for me to prepare packets for people to make me blocks for the NEMQG bee. I am using that little girl/Thumbelina print I purchased in Colorado a few months ago as the focus print. I am going with a plum/gray theme and have been surprised at how much of this I have in my stash. Gray is definitely all the rage this year. I am working on making a block before I sort it all out and feel confident that I like the result. I hope everyone had a nice holiday weekend. Our festivities are continuing today as I head into Boston to see Nick get sworn in as an officially licensed attorney. The plan is to go to the Museum of Science afterwards, for Gregory's benefit, should be lots of fun! This is what our house looks like this morning before we are off to NH to spend Thanksgiving with some of my family. Gregory is obsessed with being read to and it's been lots of fun. The delay in receiving the fabric for the Tufted Tweets quilt forced me to work on the UFO guitar quilt - I should finish the binding today. I also have been working on some items for the December NEMQG meeting but I can't reveal them yet. OOPS- I accidently published this post in the New England Modern Quilt Guild blog! Sorry guys! Nick brought Gregory to my parent's for half the day this past weekend to receive help from my dad in a simple repair on the car. This resulted in me having the house to myself. It wasn't long before I was finally able to put together my Urban Circus quilt top. I am really happy with how it came out but will do a full reveal once it's completed. In preparation for the NEMQG meeting, we all made a tree block to applique patchwork leaves to. Joanna has a great tutorial here. I loved out meeting and appreciated the personal instruction on how to do needle-turn applique but I have to admit I found it challenging! I rescued another vintage quilt from a thrift store. It needs a wash but for $10 I think I received a great deal! I love it's scrappy look! While I was photographing the vintage quilt, I thought it would be fun to photograph two of the first quilts I have ever made: This quilt was from a pattern out of Country Quilts in a Day by Fran Roen. That book was my introduction into how to quilt- it's pretty quirky with deplorable color/print combinations, odd black and white illustrations, and zillions of typos. Still, the book is a bit sentimental, as it introduced me to the craft I really love today. I have always been drawn to patchwork quilts, so it is not surprising that one of the first ones I made is a bunch of large squares sewn together. Though I am proud that I have taught myself how to quilt, I wish someone had told me some of the basics - I ended up learning "the hard way" in a lot of cases. I wish I would've known why you shouldn't use Joann's and Wal-Mart fabrics in quilting, the importance of a 1/4" seam, how to quilt a quilt, the importance of quality batting, etc. What is a sewing/quilting tip that you wish you had known? This week and last week, I have been working on some projects for a friend. She recently watched my baby for 3 whole days and I promised her I would make her a few things in exchange. She is an artist and enjoys getting her designs printed on fabric via Spoonflower. First, I made her two "brainy balls" for her niece and nephew. I really liked her designs and I think they worked well with the brainy balls. (The airplane print is paired with a Michael Miller Ta Dot). I found the Spoonflower fabric a bit difficult to work with for these balls- mostly when I was sewing the wedges together with the citrus-themed fabrics. The texture of the fabric is kind of coarse and it literally hurt my fingers to do the hand-sewing. Finally, here is a purse she asked me to make. Now I have made this purse seven times! I think I love the pattern so much because it has a "patchwork" element that can be modern/young looking. I was quite happy with the way it turned out. Natalie is very happy with these things and I couldn't be more grateful to her for taking great care of my kiddo. 1) Every Joann's in the area has run out of a pre-quilted solid I always use to make the above bag. I even had my mom pick up a piece of the fabric at her Joann's - it turned out to not be the right one (it was not my mom's fault - apparently the sales associate thought that "off-white" meant "an ugly, cheap imitation of linen")! I ended up having to improvise and make a substitution. 3) I borrowed an emroidery hoop to do some embellishment on a flickr bee block. It was awesome when I took off the hoop only to discover that it had left streaks of dirt on my bee block! I know we all have these sewing debacles - but three in a row has been a bit much! Thank goodness I found out about a quilt show to attend last week. It had been a LONG week as I didn't schedule much in order to encourage my son to get back to his twice a day nap schedule. Anyway, by Friday, I HAD to get out of the house! My mom came with me to a quilt show in Nashua, NH: A Quilter's Gathering. After having attended two major shows in Manchester and Lowell this summer, this one in Nashua felt very small and I definitely felt that it was more about vendors than being a quilt show. But I still had a lot of fun and really appreciated my mother's help in watching Gregory while we browsed. This quilt was my favorite one displayed - it's whole cloth with very intricate quilting. The other side was completley white with different colors of thread in the same design. Very impressive! There was a nice display of Amish quilts - all hand-pieced and often made from scraps. This star one was my favorite. Of course I was drawn to a hexagonal quilt, I couldn't believe when I discovered that this quilt was made entirely out of chicken and egg fabrics! The use of solids in this quilt was very eye-catching. This quilt was my mother's favorite - it was made using a fabric folding technique. Of course, I ended up breaking my fabric diet and found a few goodies. The Joel Dewberry chocolate woodgrain is one of my FAVORITES! I bought all that they had (only 2 yds) for $5 per yard! 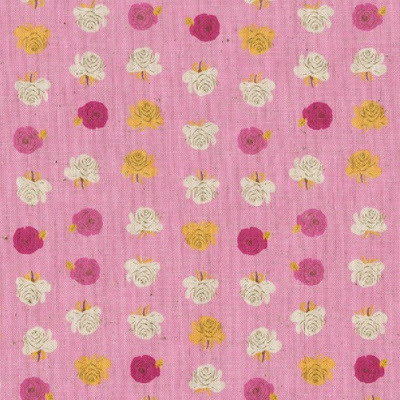 I heard a rumor that this fabric is going to be reprinted by the end of the year - the fabric company would be wise to do so, as this fabric is highly sought after. I also couldn't resist the little bikes - I had never seen that print before and it's a fun boy-ish fabric! I promise I have been doing lots of sewing lately - right now I am working on some promised projects for a friend. I will post very soon with the completed results! My SIL recently congratulated me for finally creating a sewing blog as opposed to a fabric blog. Scroll back to some of my older posts and you will soon see that most of my entries were pictures of fabric - nothing created out of them. It was laughable - but hey - I am the first one to admit that I like fabric more than sewing! All Star 2 recently hit the shelves. 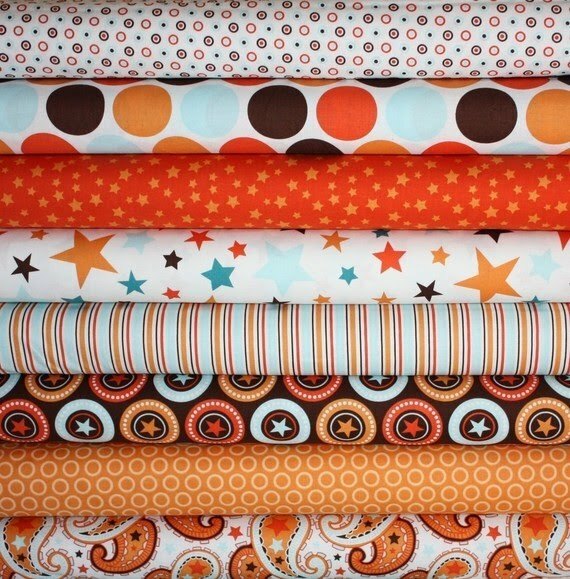 It seems like a great collection of boy fabrics and definitely not babyish. 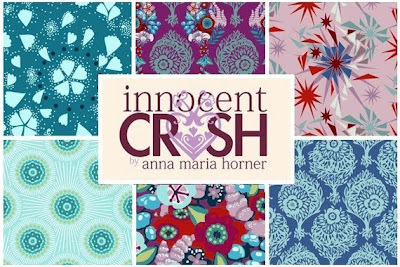 Finally, everyone in blogland seems to be going nuts for Innocent Crush. I particularly like the blue/purple line. 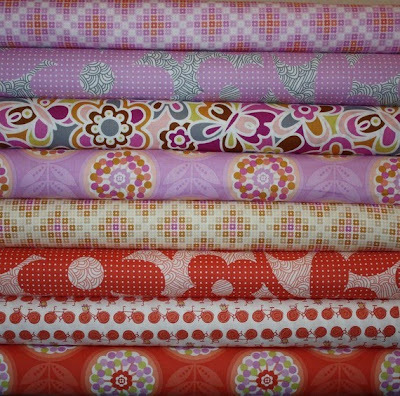 But I am on the fence on ever making a quilt out of any of it - I already have a Good Folks quilt top and a small stash of her earlier collections - Bohemian and Garden Party. How many really crazy/busy AMH quilts does a girl really need? 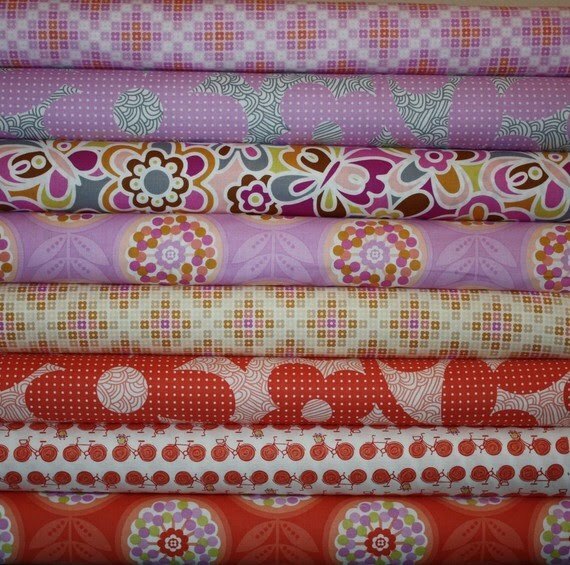 I don't have a picture of it, but you should really check out this upcoming line from Moda: Sherbet Pips. It is incredibly adorable and especially appropriate for a little girl. It doesn't come out until April 2011. 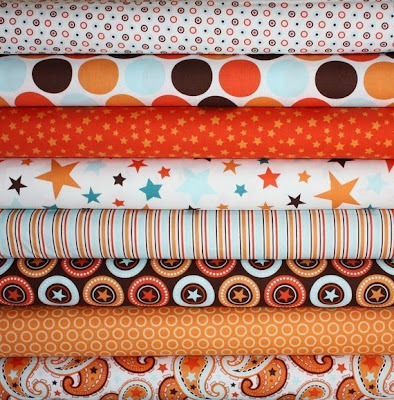 I have been thinking lately that a lot of the "modern" fabrics I am drawn to are often kid-oriented. I can't really think of a collection that is out right now that I would use to make a blanket for say, my mom. I don't really think she would appreciate something with big bright owls or fairy tale characters. She likes modern fabrics and colors - but wouldn't appreciate a major rainbow from Remix or bees and hummingbirds like Flora and Fauna. Am I missing something out there in the market? Fabric pictures courtesy of FabricShoppe.